Kenilworth Runners' Keith Beasley, Dan Leng and Wayne Briggs at Warley Woods. Leamington C&AC sent 28 runners to Warley Woods in Birmingham for the second race in the Birmingham League Cross-Country season. 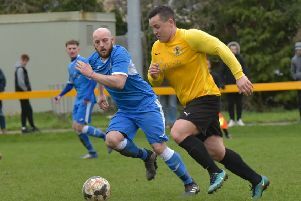 However, despite the large turnout, they were missing some of their star performers and finished 13th of the 16 teams to slip dangerously close to the Division One relegation zone. Kelly Edwards on her way to masters' victory. On a winding 5.5 mile course made trickier by heavy morning rain, Paul Andrew was first home for the club, clocking 32min 25sec for a respectable 52nd position in an extremely high quality field dominated by Birchfield Harriers and Loughborough and Birmingham Universities. Phil Gould (33:25) was 81st, with Greg West (34:02) and Dominic Priest (34:42) finishing 102nd and 122nd, respectively. Iain McLaughlin (124th in 34:50) and Vassilis Andreoulakis (129th in 35:04) completed the A team. Gavin Fowler (169th in 36:51)), Charlie Staveley (173rd in 37:01), Jason Hill (182nd in 37:15), Dean Mawby (185th in 37:17), Jeremy Coward (197th in 37:43) and Richard Merrell (206th in 38:00) scored for the B team who finished 12th out of 13th teams. Sarah Rose is the thick of the action early on. Kenilworth Runners are also locked in a desperate battle to stay up after finishing 14th on the day. Andrew Siggers was first home for Kenilworth, crossing the line 67th in 33:20. Ben Taylor (86th in 33:43), George Crawford (87th in 33:45), Andy Crabtree (104th in 33:45), Dewi Williams (133rd in 35:19) and Matt Dyer (149th in 35:54) were the team counters on the day. Kenilworth’s B team of Wayne Briggs (36:31), Nick William (36:42), Keith Beasley (36:42), Dan Leng (37:04), Ryan Baker (37:16) and Bradlee Tod (37:50) finished tenth. Leamington C&AC’s ladies were closer to home at the Welcombe Hills outside Stratford-upon-Avon for their Midland League Division One encounter. A two-lap course featured three steep climbs per lap and even the flat bits could be considered undulating. Kelly Edwards was in her usual fine form, finishing eighth overall in 27:04 and taking first place for the masters’ team. Like their male counterparts, Leamington were missing a number of their stronger runners and fellow master Jenny Jeeves (29:27) was the next counter, coming home in 31st position. Zara Blower (44th in 30:35) was third home for the club, with Saffia Del Torre (60th in 31:29) the fourth counter to complete the winning masters’ team. Leamington currently sit seventh overall after the two races, with the masters’ team having increased their lead at the top of the standings. Sarah Rose finished 20th overall in 28:20 and second master as Kenilworth finished ninth out of 14 on the day and third masters’ team. Laura Pettifer (45th in 30:43), Kelly Burnett-Nicholl (66th in 32:23) and Shanika Samarasekera (75th in 32:53) completed their senior counters. The 24-strong Spa Striders’ team finished eighth overall, with their masters team splitting Leamington and Kenilworth. They were once again led home by Claire Murphy (29:22), who was 27th overall and third master. Behind her, Laura Peake (50th in 31:05), Fiona Edwards (52nd in 31:07) and Clare Hinton (31:19) completed the senior scorers, with Peake and Hinton joining Murphy in the third-placed masters’ team. Division Two of the Birmingham League also took place at Stratford, with Spa Striders’ men finishing ninth on the day to bolster their chances of staving off relegation. Club captain Chris McKeown led from the front, bringing them home in 39:07 and finishing 17th overall. He was joined in the counting team by Ian Allen (27th in 39:57), Adam Notley (28th in 40:03), David Mills (44th in 41:01), Steve Taylor (61st in 41:58) and Dexter Teale (114th in 45:03). The B team of Keith Wilson (121st in 45:20), Pete Teevan (124th in 45:26), Chris Wilson (127th in 45:44), Simon Parsons (130th in 45:56), Dan Stannard (158th in 48:58) and Clive Parpworth (161st in 49:09) were seventh from 11 teams. Elsewhere, Spa Striders’ Charlotte Everard was third lady at the Dark Peaks 14 mile in Yorkshire. Rich Sykes and Lucy Tugwell took on the Petzl Nightrunner in Grizedale, a 10k plus off-road route. Sykes clocked 43:39 to finish tenth overall and third V40, while Tugwell was 13th lady and seventh senior in 54:45. Striders’ Liz Draper completed the Valencia Marathon in 4:51.